This is how the cheese looks when it's ready to wax. This is my pathetic little waxpot- an old cappuccino frother. 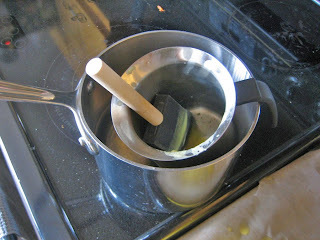 I need to get a bigger pot, because dipping cheese in wax rather than painting it on is much preferable. 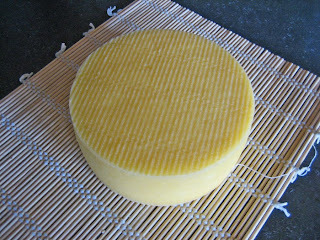 I'm using beeswax, which most cheese makers don't use because it's so expensive, but I love the scent of it. I get the wax fairly cheap from the honey man at our farmer's market. 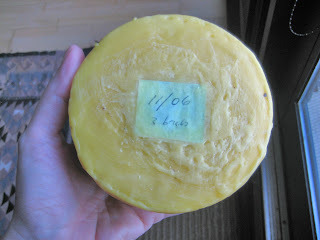 The drawback- beeswax is basically the same color as cheese, so I have to inspect the coverage very carefully. Here it is- the waxed cheese. Isn't it cute? It's a cheese wheel made from one gallon of milk. I date it on the day I wax it. Now into the cheese cave it goes. I should have waxed this cheese about 2 days earlier- cheddar should be waxed as soon it's dry to the touch... but it sort of got away from me. It will be ready to eat in about 2 months, or longer if I can wait that long. There are 3 other cheddars ahead of it, so I think I can wait. It is so cute and satisfying, loving it! Do we get to see the CHEESE CAVE next? It looks wonderful! I love the smell of beeswax too - we use it to polish our table. I've never really given much thought to cheese wax. See, this is why I love your blog. What is cheese wax made from anyway? Commercial cheese wax is paraffin, which is made from mineral oil- which is a by-product of petroleum. I don't want petroleum on my home-made cheese, even if it is deemed "food safe". Wow! I just stumbled onto your blog and you've already inspired me to do waaaaay more than just drink the raw milk I just bought! Looking forward to reading more!